Capt. 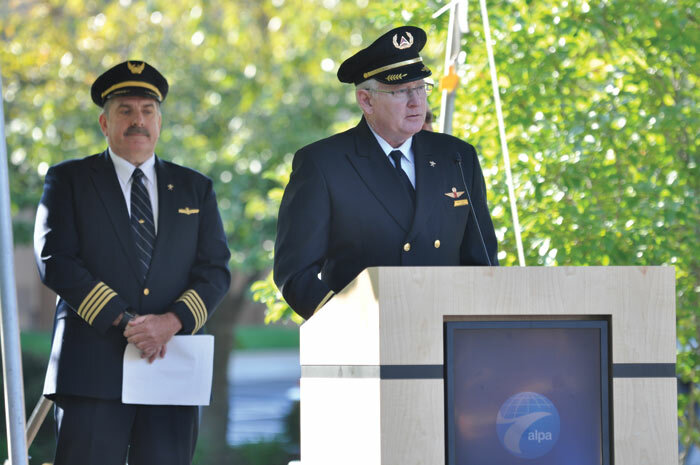 Tim Canoll, ALPA’s president, front, addresses those attending the ceremony in ALPA’s Remembrance Garden as Capt. Joseph Genovese (United), his pilot group’s executive administrator, looks on. ALPA pilots, family members, friends, and staff gathered in the Remembrance Garden at the Association’s Herndon, Va., offices for a commemorative ceremony on the morning of September 11 to honor those who perished in the 9/11 terrorist attacks. Under a bright blue sky reminiscent of the one in New York; Washington, D.C.; and southwestern Pennsylvania on that fateful day, attendees paid their respects. “The sting of those horrific acts, no matter how long ago, will never fade,” said Capt. Tim Canoll, ALPA’s president, in his opening remarks, adding, “even with the passage of time, it’s a constant reminder of why vigilance is so critical and why the safety and security work we do is so important. In honor of those lost, Capt. Joe DePete, ALPA’s first vice president, rang a bell after Canoll read aloud each of the names of the pilots, flight attendants, and other airline employees aboard United Airlines Flights 93 and 175 and American Airlines Flights 11 and 77 on Sept. 11, 2001. In addition to pilot officers, Ron Rindfleisch from the Association’s Representation Department participated in the ceremony, asking those gathered to recall where they were that day. He recounted an exchange he had with his youngest daughter and the importance of reminding “our youth what happened on that horrific day.” He then led a brief prayer. Jody Krazeise from ALPA’s IT Operations and Services Department led the group in singing Amazing Grace. She later led ceremony attendees in singing America the Beautiful as Capt. Bill Couette, ALPA’s vice president–administration/secretary, and Capt. Randy Helling, the Association’s vice president–finance/treasurer, placed a wreath at the center of the memorial. ALPA’s Remembrance Garden was dedicated on Sept. 11, 2006, the fifth anniversary of 9/11. The area includes a 10-ton stone from a western Pennsylvania quarry, split to represent the break that the terrorist attacks created in the airline industry. Two sections of steel I-beams from the World Trade Centers and a piece of the Pentagon’s outer wall also adorn the garden. Nearly 3,000 perished, including 265 on four airplanes, and more than 6,000 were injured as a result of the 9/11 terrorist attacks. In addition to the ceremony at ALPA’s offices, 9/11 memorials and services are held around the country each year to ensure that as a nation we never forget. Read how eight ALPA members are continuing the legacy of the 9/11 pilots in the September 2016 Air Line Pilot. View photos of the 2017 remembrance ceremony on Flickr. Watch the video of the 2017 remembrance ceremony below. This article was originally published in the October 2017 issue of Air Line Pilot.